Oh hey, I made something that wasn't completely intended to be viewed in a sexualized manner. Look at that. 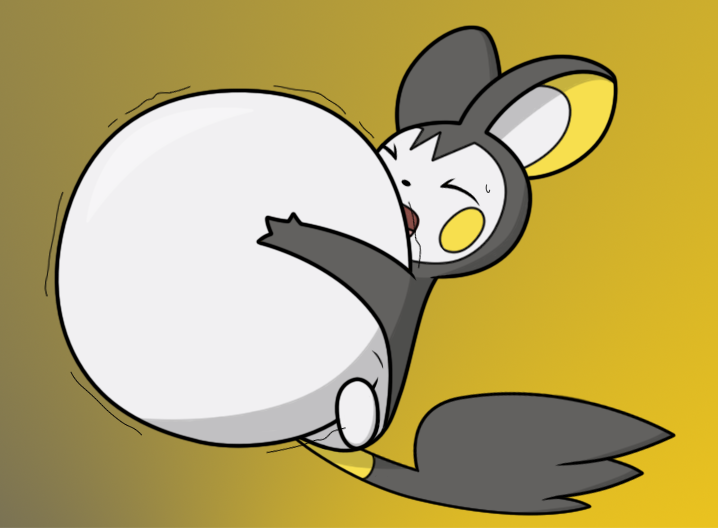 Anyways, a little emolga about to bust. Random inflation is fun, isn't it? I don't really intend to make random pokémon inflations a common thing, as I'm just doing this and the other Cresselia drawings for practice, and it's helpful to use a simpler character design rather than spending two or three days on a full anthro character. Somebody requested that I draw an emolga, and given that I was going to draw something else anyways, I figured I might as well. That having been said, I think this worked out well. I definitely got the size down a bit better this time around, and the little stretch mark underneath the emolga's wing is a decent touch. I also had a chance to include the whole face (well, the mouth got a bit cut off, but most of it), unlike I did with Cresselia, although I'm not sure if it's better with or without the mouth - the inclusion or absence of the mouth makes for a very different expression, and I'm not sure if either one is better. You can see the drawing without the mouth here. The issue now is being able to translate this to something more anthropomorphic in a less PG context. As usual, any input on how I could improve my inflation is appreciated, but I'm actually satisfied with making something look like its reached its limits this time around. We'll have to see how it goes with my next work when I finally resume my usual subject matter.